Astronomers at the University of Utah have noticed that the centers of massive galaxies are getting denser. Massive elliptical galaxies are the biggest and most massive kind of galaxies. These galaxies may contain over a hundred billion stars. Since 84% of the universe is composed of dark matter, the resulting mass of one of these galaxies may well approach that of a trillion stars. "We found that during the last 6 billion years, the matter that makes up massive elliptical galaxies is getting more concentrated toward the centers of those galaxies. This is evidence that big galaxies are crashing into other big galaxies to make even bigger galaxies," says astronomer Adam Bolton, principal author of the new study. The left image, taken by the Hubble Space Telescope, shows a ring of light from a distant galaxy surrounding a closer or foreground galaxy (galaxy SDSS J1631 + 1854), which is at the center of the left image. The closer galaxy is called a “gravitational lens” because its gravity bends light from the more distant galaxy to form the ring of light, named an Einstein ring, as seen from the telescope. 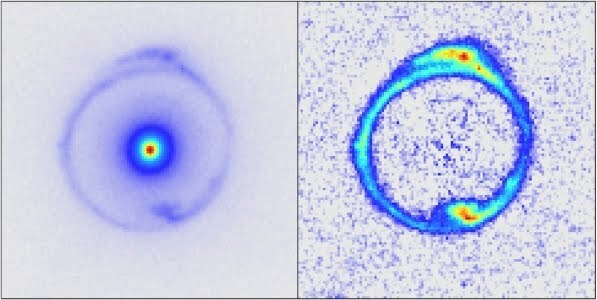 The image on the right has been adjusted to remove the lens galaxy and show the ring more clearly. In a new study, University of Utah astronomer Adam Bolton and colleagues measured these Einstein rings to determine the mass of 79 lens galaxies that are massive elliptical galaxies, the largest kind of galaxy with 100 billion stars. The study found the centers of these big galaxies are getting denser over time, evidence of repeated collisions between massive galaxies. Bolton believes that when two big galaxies collide with each other, the result would be one galaxy "eating" into the other which leads to its increase of mass density at the center. When a massive elliptical galaxy collides with a smaller galaxy, the result would be the smaller one being completely "absorbed" or "consumed" by the bigger galaxy. Bolotn believes that this kind of collision does not contribute to an increase mass density at the center. What he thinks would happen would be the mass be distributed more at the outer edges of the galaxy. With these two kinds of collision, the small galaxy to big galaxy collision can explain why some galaxies have more starlight away from its center. While the big galaxy to big galaxy collision can explain the concentrated mass within the center. "Both processes are important to explain the overall picture," Bolton says. "The way the starlight evolves cannot be explained by the big collisions, so we really need both kinds of collisions, major and minor – a few big ones and a lot of small ones."